I am really in love with homemade pasta, but making ravioli is a true labor of love. We have done so much traveling this summer, that I haven’t had the opportunity or the will to spend time in the kitchen. Our first weekend at home, I got the cooking itch and spent five glorious hours preparing these tasty pasta pockets. 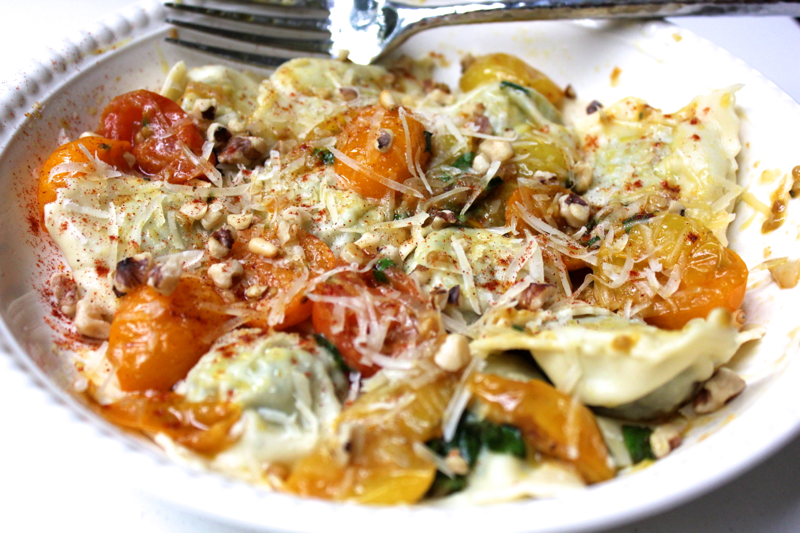 It is much easier to make ravioli when you’re using leftovers in your filling or a filling that doesn’t require much preparation, like pumpkin. 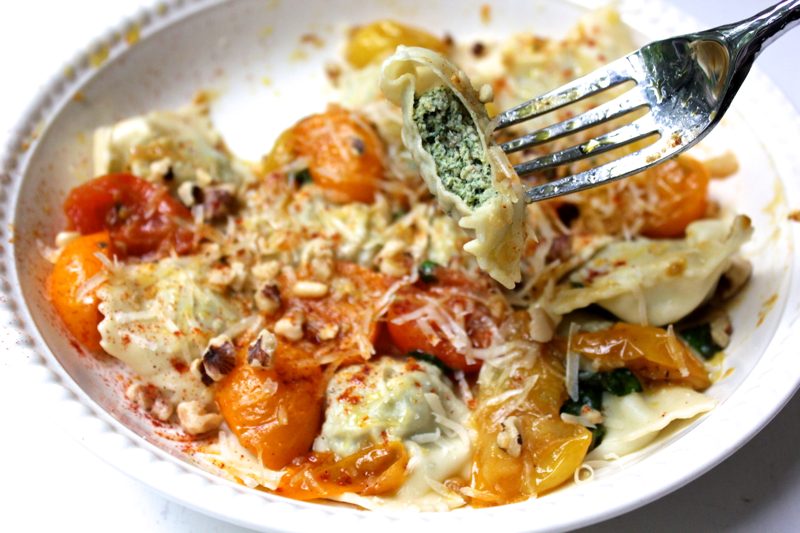 So if you’re making a meal with chicken and swiss chard, set some aside to stuff in ravioli! To make enough ravioli filling to serve four people, bring a pot of water to a boil, and drop in 1 chicken breast and 1 tablespoon of smoked paprika. Let the chicken simmer for about 10 minutes until it is opaque, firm, and fully cooked. 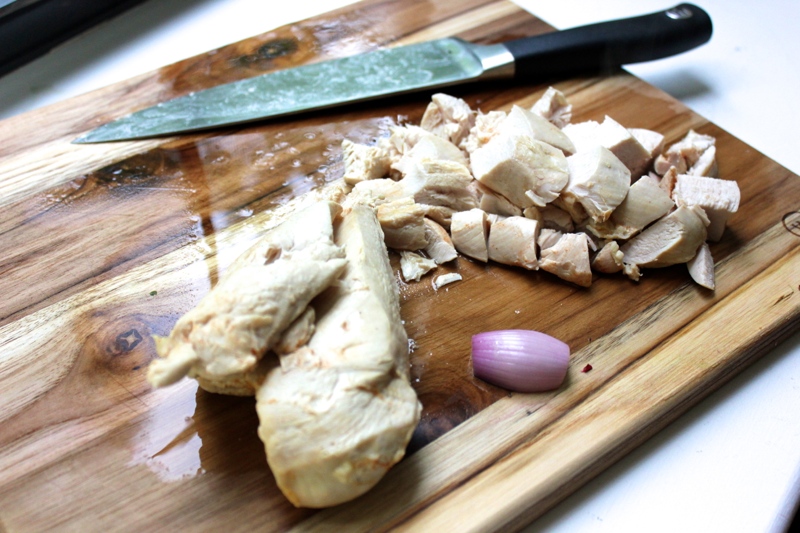 Set the chicken aside to cool, and then dice it. While the chicken cooks, cut up a large bunch of swiss chard leaves, their stems, and two cloves of garlic. Sauté the garlic and the stems in olive oil until they soften, and then add the swiss chard leaves to the pan. Cover your pan to help the leaves wilt. 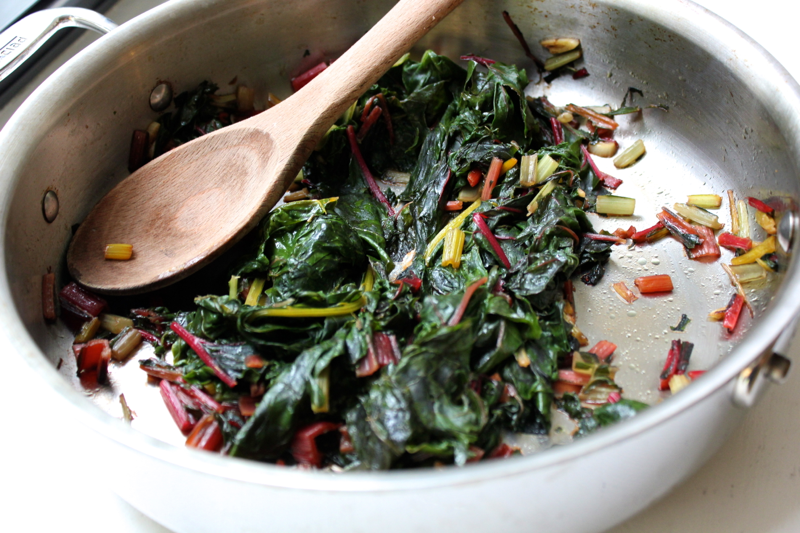 Once the chard is cooked, season it with salt and pepper, and let it cool. Drop 1/2 shallot into a running food processor to mince it. 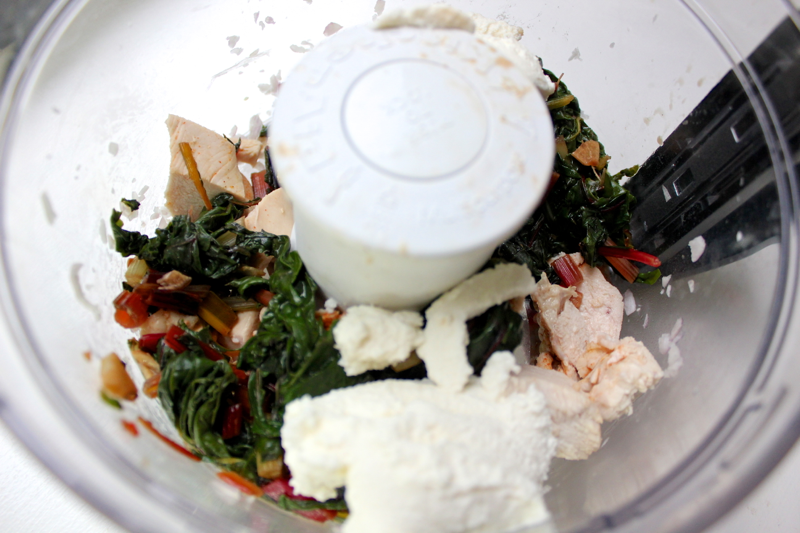 Then, add in the diced chicken breast, 1 cup of the swiss chard, and 1/2 cup of ricotta cheese. 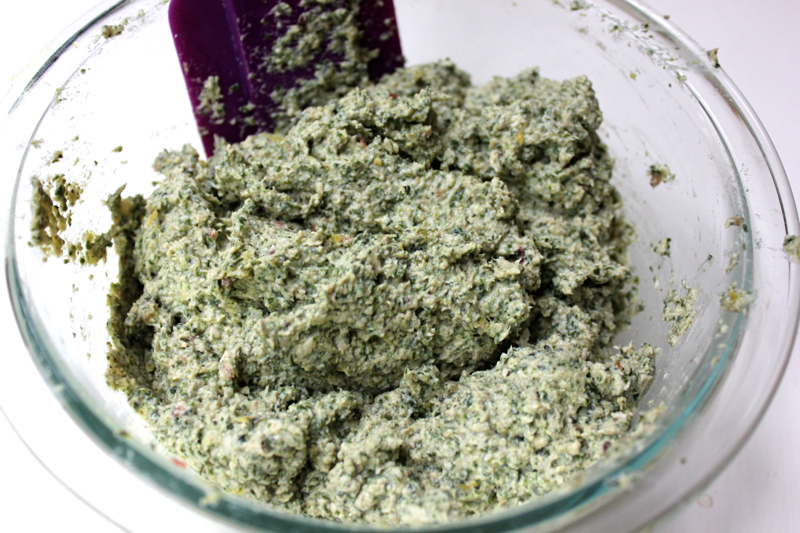 Run the food processor until the ingredients are finely chopped and evenly combined. Transfer the filling mixture to a bowl, and season it very well with salt, pepper, and 2 teaspoons of lemon zest. You should over-season ravioli filling so that it packs a punch through the pasta. Refrigerate the filling while you prepare the pasta dough. Add 1 cup of flour to a bowl, make a well in the center of the flour, and crack in 2 eggs. Drizzle in 1 tablespoon of olive oil, and throw in a pinch of salt. Using a fork, scramble the eggs in the center of the bowl. When the eggs are scrambled, begin incorporating the flour. The flour should form a craggy ball of dough. Turn the dough out onto a floured surface, and knead the dough very well until it becomes elastic. If you’re using a KitchenAid pasta roller, set it to number 1. Otherwise, use your pasta roller’s widest setting. Run the pasta through the roller. Flour the pasta lightly if it is too tacky. 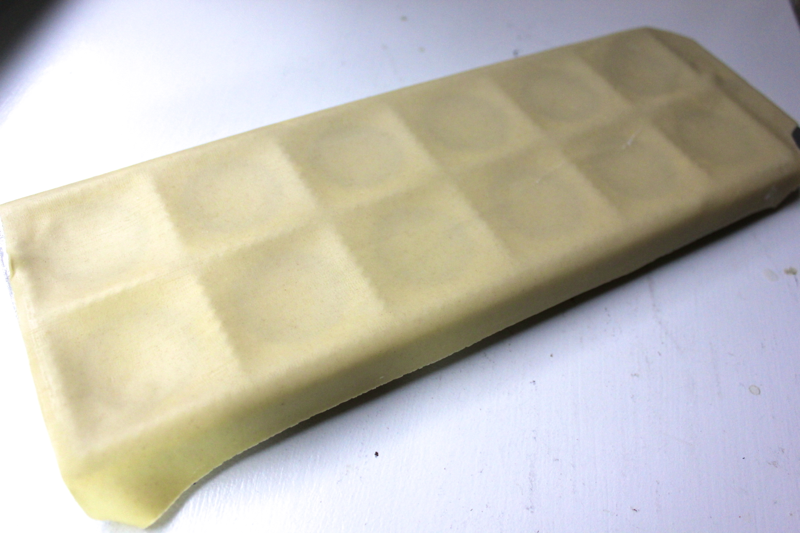 Then, fold it into thirds, and slap down on it to remove any air bubbles. Continue passing the pasta through the roller at setting 1, flouring if necessary, and folding it into thirds until it becomes elastic. Then, turn the roller to setting number 2, or the next thickest setting. Pass the pasta through once, with the wide side going in first so the sheets are wide enough for the ravioli mold. Do not fold the pasta. Continue decreasing the roller settings, passing the pasta through once, until you reach setting number 8, or the thinnest setting. If the pasta gets too long to manage during this process, you can use a sharp knife to cut it into sections. Just remember which setting the pasta was on when you cut it so you can continue rolling where you left off. Flour the ravioli mold, and lay one sheet of pasta over it. 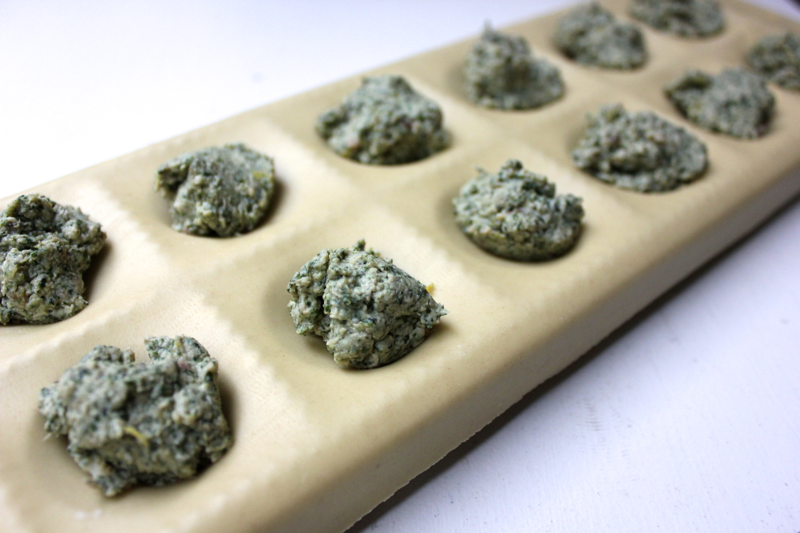 Place even spoonfuls of the chicken-swiss chard filling in the center of each ravioli, making sure to keep it away from the edges. Prepare an egg wash by whisking together 1 egg and a splash of water. 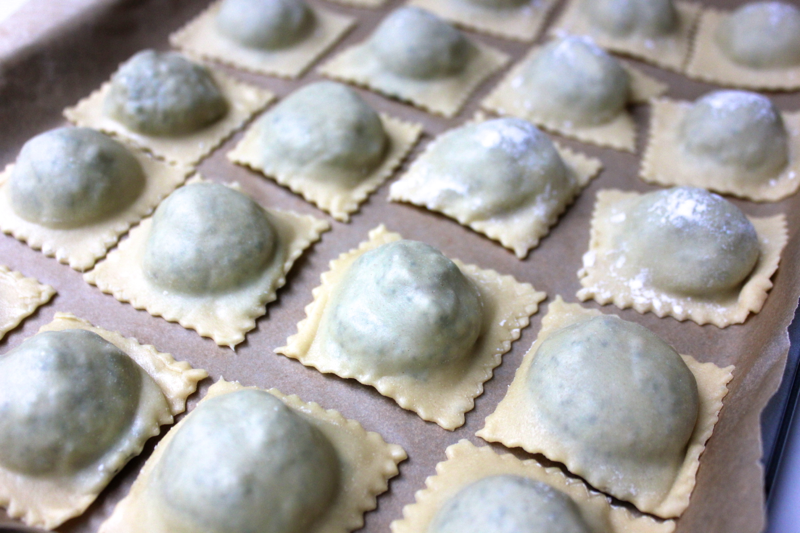 Use a pastry brush to paint the egg wash around the sides of the filling so that the ravioli seal. 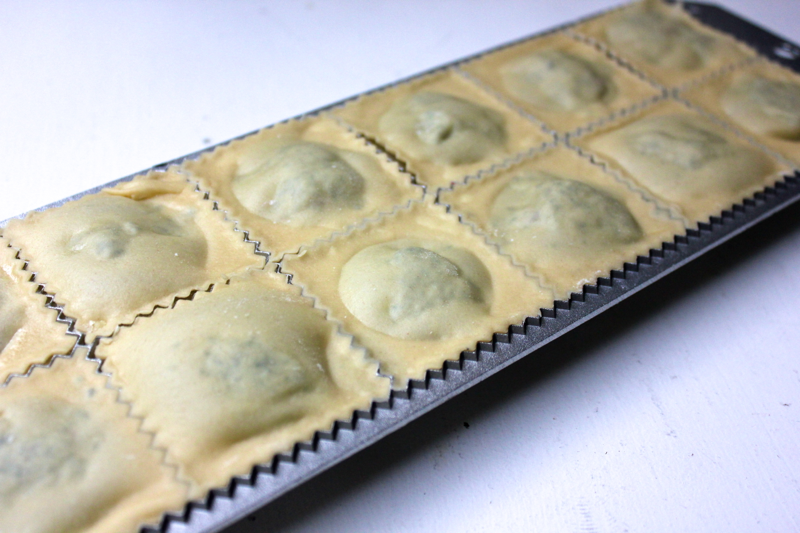 Carefully lay a second sheet of pasta over the mold, taking care to press the air out of each ravioli. Run a rolling pin around the sides of the ravioli mold to cut away the extra pasta, and then, in a quick motion, flip the mold over and sharply rap it down to force the ravioli out. Cut the ravioli apart, and place them on a parchment-lined baking sheet while you continue forming the rest of the ravioli. Once the ravioli are formed, prepare your pasta sauce. The sauce should be ready and waiting to receive the ravioli once it is cooked. 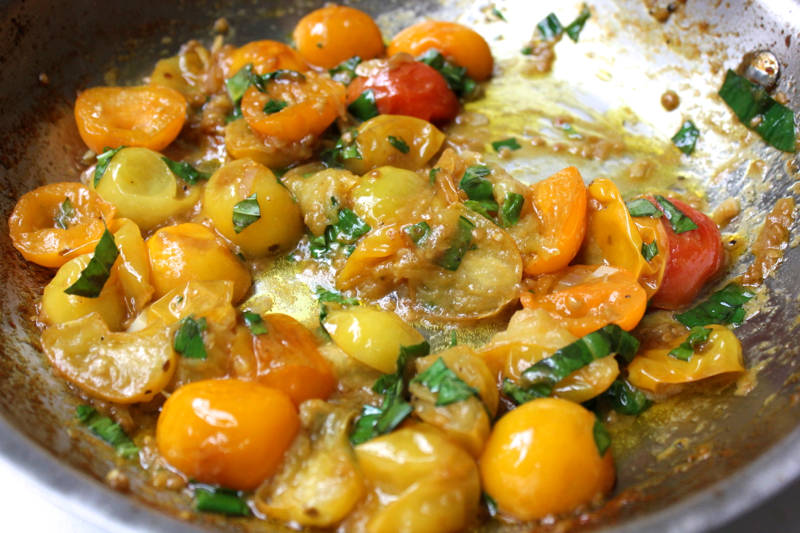 Halve two cups of grape tomatoes, and mince 2 cloves of garlic. Warm some olive oil in a pan over medium heat, and add in the tomatoes and garlic. 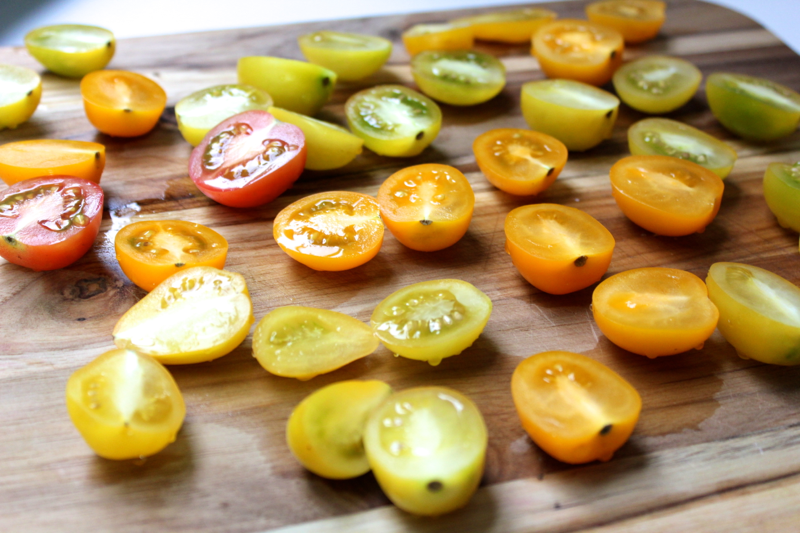 Allow the tomatoes to caramelize and burst, and then season the sauce with salt, pepper, fresh basil, and more olive oil. Then, boil your ravioli in batches for approximately 3-4 minutes until the ravioli float and become transparent enough for you to see the filling. Drain the ravioli, toss them in the sauce, and transfer them to a bowl.